Thundarr was #1. Spidey was #2. I always wondered: what happened to all those ice bridges after the friends beat the bad guys and went back to Aunt May’s? It’s better not to think about the answer as an adult. 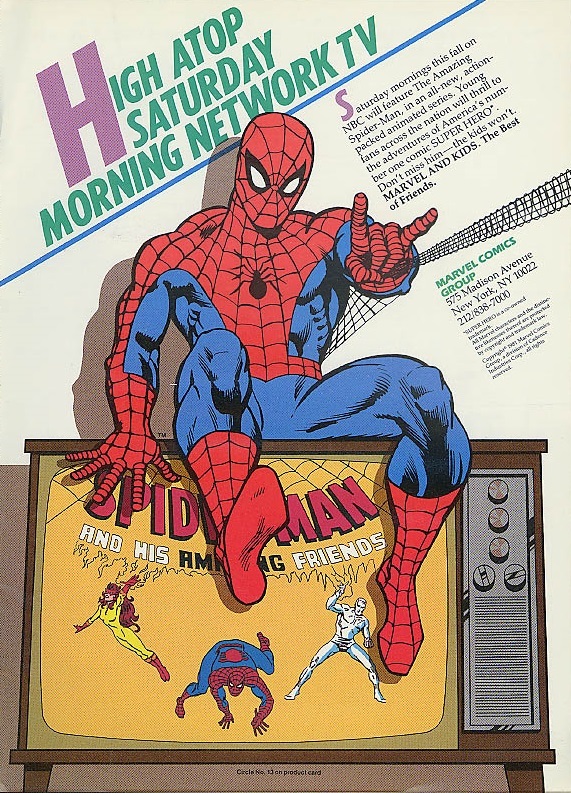 Spider-man and His Amazing Friends: yet another disappointment in my young tv viewing life. I longed for a show to represent what I read in the comics. The live action Spider-man show failed me miserably. I liked “The Incredible Hulk” live action show, but I think we can agree it was nothing like the comic. “The Fantastic Four” cartoon featured Herbie the Robot instead of The Human Torch (who was my favorite character aside from Spider-man at the time). The Thing on the Flintstone’s cartoon wasn’t the ever lovin’ blue-eyed Thing, but rather “Benjy Grimm” who became the Thing when his “Thing Ring” caused rocks to cover him. The live action “Captain America” show where he wore a ridiculous motorcycle helmet. The Dr. Strange from the live action show looked nothing like the one I knew from the comics. Then finally, I heard Spider-man was going to have his own cartoon. I vividly recall watching the opening credits and being flabbergasted by “and his Amazing Friends”, one of whom wasn’t even a character in the then Marvel world (FIrestar). And they all lived with Aunt May, with a secret transforming lab. And don’t get me started on Ms. Lion. Oy. But I did watch and was happy to see actual villains from the comics and other heroes making crossovers. I recall the animation went downhill in the second season.